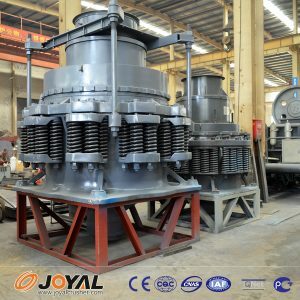 Spring cone crusher is a commonly used ore crushing machinery and equipment, of course spring cone crusher as a large ore crusher machinery equipment, is composed of very many parts, in the above, the Shanghai Zhuo Ya mining machinery has been simple and We talked about the key parts of the spring cone crusher, where joyal continue to add to you, to deepen everyone on the spring cone crusher this understanding of the ore crusher. The cone of the spring cone crusher is cast between the liner and the cone to ensure that it is tightly bonded. The crushing cone is mounted on the spindle and its lower surface is spherical and supported by spherical bearings. The lower end of the spindle is inserted into the conical hole of the eccentric sleeve. When the motor is driven by the bevel gear to rotate the eccentric sleeve, the spindle and the crushing cone supported by the spherical bearing are used for the purpose of breaking the ore. Spring cone crusher is the ore and other materials such as broken processing. Spring cone crusher adjustment device is a very critical part of the machine, but also rely on these parts on the size of the material adjustment. The adjustment device is actually a part of the fixed cone, consisting of an adjustment ring, a support ring lock nut, a push hydraulic cylinder, a lock cylinder and a piston. The support ring is mounted on the top of the frame and is fastened to the frame by means of a tension spring around the crusher. The support ring and the adjustment ring are serrated at the contact surface. When the need to adjust the discharge port, the first lock cylinder unloading, so that the serrated thread to relax, and then manipulate the hydraulic system, start pushing the hydraulic cylinder, driven by the adjustment ring for the rotary motion, due to the jagged thread drive, Or fall, so as to achieve the purpose of adjusting the discharge port.